I love La Jolla. Out of all the places that we have visited in San Diego, La Jolla is my favorite place to be. I love the beaches, the views and how photogenic that little part of SoCal is. Correct me if I’m wrong, but it also seems a bit quieter than the neighboring Pacific Beach and just an overall cool place to hang out. This image was taken after a night of rain. 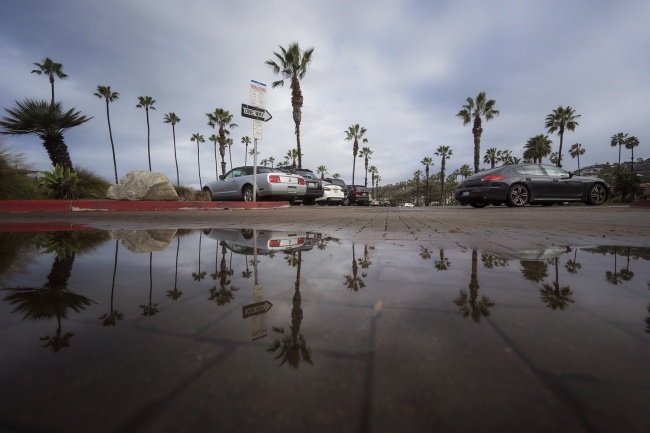 It actually rained a couple of times while we were out there which was so weird because I thought it never rained in southern California? Anyways, Vincent was taking another surf lesson at sunrise so Andrew and I decided to tag along. We figured we could bring Frankie and let him run around on the beach before a lot of people got there and I could also take some early morning shots too. It turned out to such a quiet and beautiful morning of just walking in the sand and flying the drone. But after awhile both Andrew and I got a little hungry. We found a cafe close by that we could walk to but along the way we had to walk across the parking lot. It was like hitting the puddle jacket pot. I also distinctly remember saying out loud “oh snap, reflections ahead”. LOL. Who does that? It must have been my way of warning Andrew that we were going to be in the parking lot for a little while. But honestly, if I had to pick one place with the best palm trees in San Diego, La Jolla Shores has to be it. There’s nothing special or different about them. The only difference is that there’s a lot of them on area. My camera settings for this image is F4 at 1/5000th sec at ISO 800 with my Sony A7II and 16-35mm wide angle lens. If you haven’t noticed before, but this is my favorite puddle at the Tidal Basin as seen here and here. It is a little sad to say that statement because there really aren’t supposed to be puddles and this one is pretty much there all the time. But if I had to choose, it would be this one. It’s hard to miss, if you turn towards the left right when you get off the footbridge, just look down. You will see it. 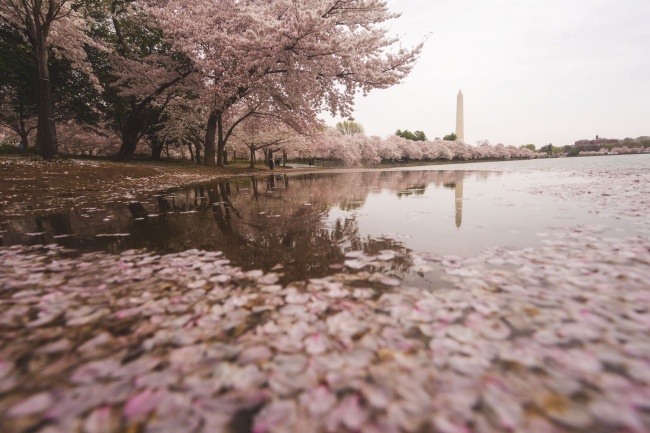 I love it so much because the trees around the puddle are so long that they stretch into the tidal basin and when you see the reflection from the puddle, it looks like this awesome tunnel of flowers. My camera settings for this image is F8 at 1/160th of a second at ISO 200 with my Sony A7II and 28-70mm zoom lens. Today is the day! 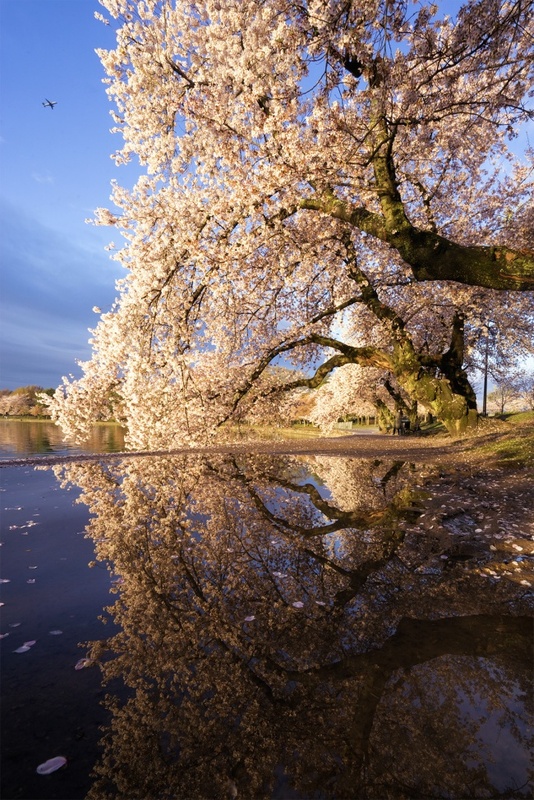 Today is the day that the National Mall NPS will announce their predicted peak bloom date for the cherry blossoms. I can’t wait. I’ve been on twitter everyday this week checking out what they say and what Capital Weather Gang has to say about the weather we’ve been having and how they’d effect the Cherry trees. As a side note, I’m pretty sure I just gained 10 cool points from that last statement. LOL. As of now, I’m just excited for the big announcement! PS. Today is also the day that my March monthly newsletter goes out. If you haven’t already, make sure to sign up. I have a couple of really exciting announcements of my own that I’ll be announcing on the newsletter first! Ok, now back to the image on this blog post. This was taken last year, early morning on a particularly beautiful day. 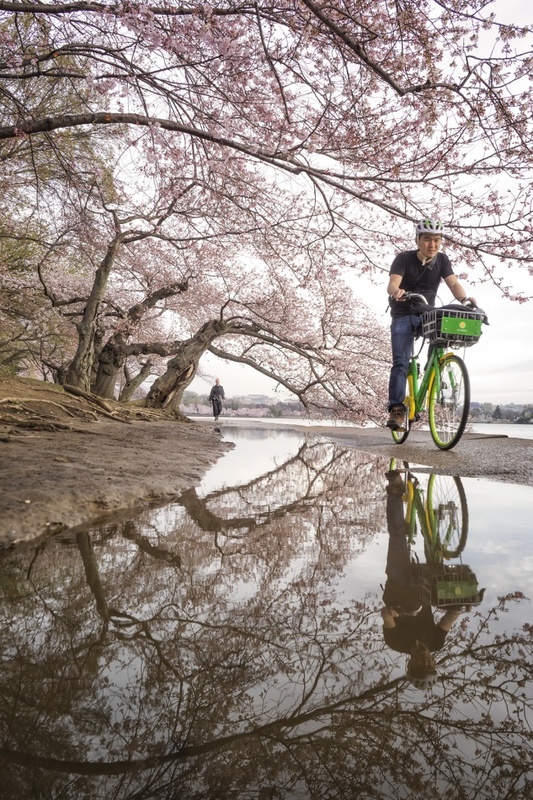 It was the day after it rained and it created these amazing puddles all along the Tidal Basin sidewalks. It also rained so hard that there were flower petals all over the place and it felt like you were walking in a wet wonderland of pink. I had my headphones in, rain boots on, and I was having a blast walking around capturing the beautiful trees. It was just by accident that I captured the airplane flying by but I think it makes it a little more interesting to see. I also remember having to wait a little while for this area to clear because there was a big group of people standing underneath the trees taking pictures. It was well worth it because I love the way it turned out. However if you look closely enough, you will still see one person there still taking pictures. At least she’s a little camouflaged though. HAHA. The settings for this image is F18 at 1/50th of a second at ISO 400 with my Sony A7II and 16-35mm wide angle lens. I took so many pictures on this road trip. There are so many beautiful sights in this country. It’s a little difficult to figure out where to really begin. So, here’s one of the major highlights that happened at the very end of our trip when we arrived in San Diego, California. Before leaving on our road trip, we had a couple of activities in mind for San Diego. That all went out the window as soon as we arrived. We were so tired from the travels that our main objective was to just ‘chill’. No plans, nothing to do but relax and enjoy the beach town. Our first stop on the only full day that we were there was to a farmers market to pick up some breakfast. The farmers markets change locations everyday so luckily we were there for the one in La Jolla. The food is always so good at these farmers markets since they’re so fresh. I loved it. Green juice was callin’ my name. Once we were full, we walked over to La Jolla Cove in hopes to just sit on the beach and lay out. That too went out the window once we saw the seals and sea lions hanging out on the rocks. There must of be at least 20 of them! 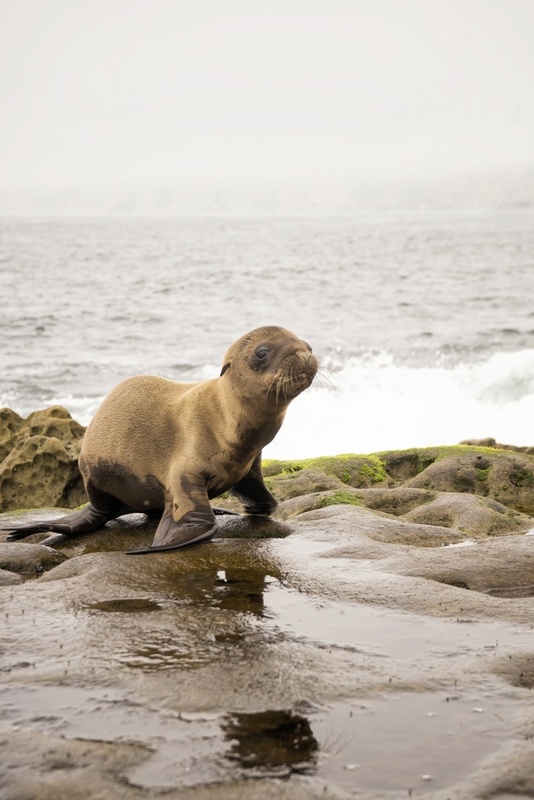 Daddy sea lions, Mama sea lions, and the cutest of them all- BABY SEA LIONS!!!! OMG we were freaking out. I’d never seen so many of them at one time. What started out as a casual walk around the cove ended up being 3 hours with these animals. I loved every minute of it. It was so fun to just watch them sleep, fight, play, and walk around. I’m not sure who squealed more, the sea lions or me. So funny story. Remember how yesterday I said that the cherry blossom won’t be peaking this year? I was wrong. I wrote that post way to soon because guess what?! Only half the cherry blossoms were really effected by the snow last week. It’s like a huge sigh of relief. I really look forward to this time of year every year and I really didn’t want to miss out on it this time. So for the last 50% of the cherry blossoms remaining, they’re expected peak date is now March 22-25th which is only a few days from now!!! I went out Sunday morning to meet up with a local instagram group called, Walk with Locals. I had been to some of their events before but this was their one year birthday so I had to go. I hate missin’ out on a good time. Even though it was wet, rainy, and snowing, there was an impressive amount of people who showed up at sunrise. We walked around the tidal basin but I kind of stayed in the back of the crowd. Eventually I was the only one walking by myself when I saw this duck. 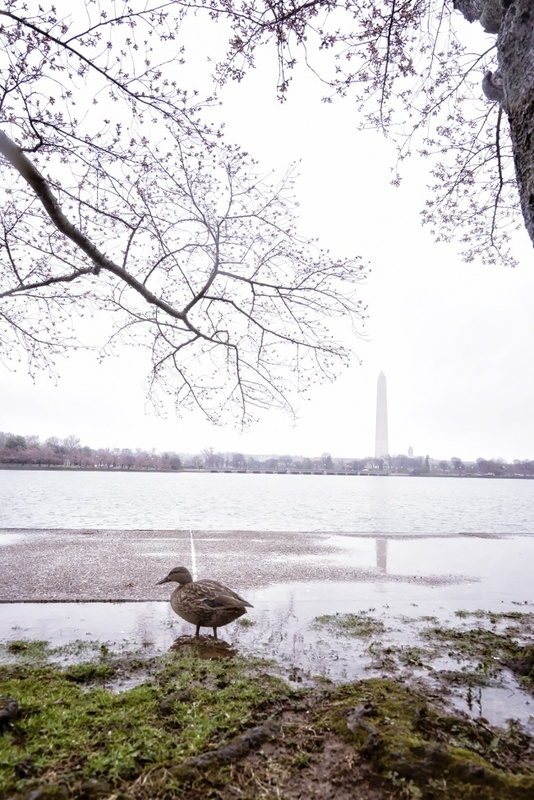 Its not uncommon to see ducks in DC, especially around the water. But this one was actually on the sidewalk. So I approached him slowly and calmly and he didn’t seem to mind me at all. We then started having our own little photoshoot. I intentionally got low so I could try to get the “cherry blossoms”, Washington Monument, and duck all in one frame. My settings were F6.3 1/100th of a second ISO 400 with my 16-35mm wide angle lens. I had to bump up my ISO high even though we were outdoors because I didn’t want any motion from the duck. It was so very grey and dark, it was difficult to get a fast enough shutter speed to make sure everything was sharp. Anyways, Happy Birthday Walk with Locals! You guys are awesome. And you know what else is awesome? Cherry Blossoms! I’ll be out there shooting. And if you are too, come say hi!